Nurture the senses with crystal energised pure essential oils in a skin nourishing macadamia oil base. 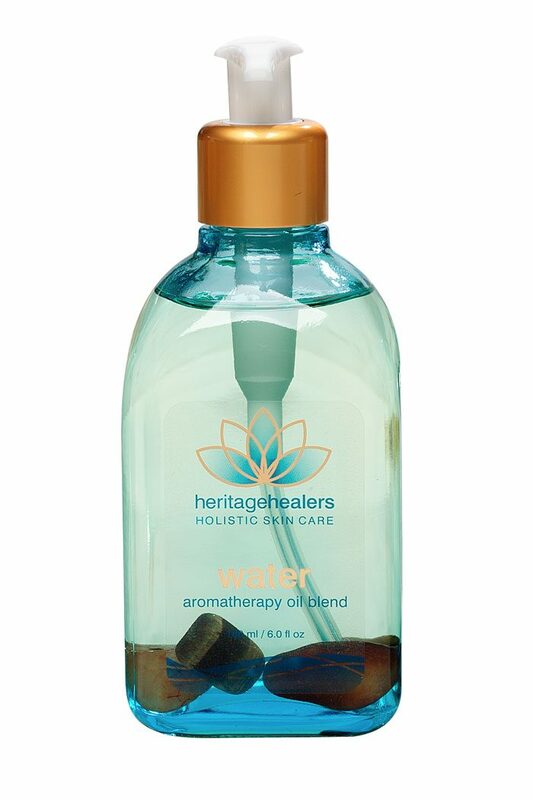 The Water Blend is for calm and relaxation. Marjoram – great for letting go, calming to intense emotions. Tigers Eye and Carnelian are crystals of the Water element and Sacral Chakra. Encourage compassion, insight, relaxation and harmony. INGREDIENTS: Macadamia Oil (Macadamia Integrifolia), Lavender Oil (Lavendula Angustifolia, herb), Clary Sage Oil (Salvia Sclarea, herb), Geranium Oil (Pelargonium Graveolens, leaf), Marjoram Oil (Origanum Majorana, leaf). Tigers Eye – enhances intuition and awareness. Increases protective energy and brings luck and happiness. Carnelian – helps with courage, focus and realisation. Helps to clear unwanted thoughts and to take control. Aids emotional balance and assists with boldness. Added to a bath, used in massage or blended with Chakra Body Essence, this essential oil blend provides an aromatherapy treat to support and strengthen you through the toughest day. Using different oil blends everyday the body senses are continually stimulated and harmonised by the specially selected essential oils and crystals. TIP: Make your own personalised Aromatic Body Essence by combining 2-3 pumps of Chakra Body Essence to 1 pump of aromatherapy massage oil blend, mix in your hands and apply after bath or shower. Caution: Aromatherapy products should not be used during pregnancy.